Berjaya Resorts has just launched their new improved website today and it's certainly gone through a makeover compared to the old one. 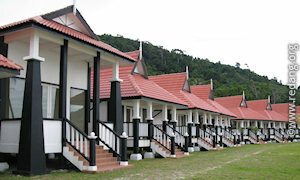 Check out their site which has more pictures of the resort and their beach at Teluk Dalam. I'll be leaving for Redang tomorrow night for my last dive of the year before monsoon season. This will be the second trip this year with Tango and Jules and hopefully we'll get to do the trek from Pasir Panjang to Teluk Dalam this time. While we're leaving by coach, we're returning by Firefly on 3 Oct. It'll be the first time for all of us taking Firefly from KT to Singapore so check back later for our impressions. My family trip has also been brought forward to 10-13 October. As usual, if any of you readers/forum members happen to be there during these dates and want to meet up for chat and drinks, just let us know - we'll be over at Laguna. With just a month and a half to go before Redang visiting season 2009 draws to a close, those of you eager to catch some sun, sand and sea should schedule your trips soon and take advantage of September and October closing season low rates. Apparently, some of the smaller resorts have already closed. Most of the others will close by mid-October with Laguna, Berjaya and Kalong holding it out till end October. Five Stars will stop their coach services between Singapore and KT by end September while Konsortium will end their services about 3.5 weeks later though bad weather could end services earlier than scheduled. If all goes as planned, I'll be making 2 more trips before end of season, a dive trip at end of the month and a family (snorkelling) trip from 13-16 October. 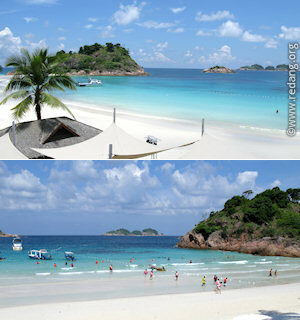 The last family trip to Redang was in 2006 so it's something we're looking forward to. I know there are some forum visitors asking questions about whether it's still fine to visit in October. While weather is hard to predict,	the fact that I'm planning my last trip of the season in mid-October should answer those questions somewhat. My past visits in October have taught me to expect cloudy skies, slightly bigger surf with some showers in the evenings, and much fewer people on the beach (and in the Marine Park Centre). If you're not prepared to take a chance, then best to wait till March 2010 when the new season begins. Apparently, there were 3 whale sharks hanging around Tenggol island a few weeks back. They were there for some time and ranged in length between 5 to 8 metres. I was supposed to go see them but the plan fell through. One of my dive buddies was fortunate enough to be there. Suffice to say it gave me 'creature envy' after seeing his photos on Facebook. I've always wanted to see mantas and whale sharks, but never got the opportunity. It must be such an unbelievable experience to be swimming next to these gentle, plankton-feeding giants. On one hand, it might be a good thing not to experience them so soon as it keeps me diving, hoping to see them. 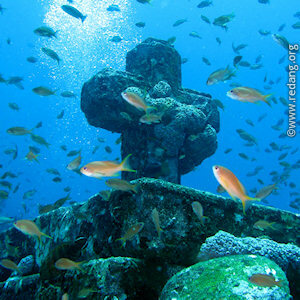 After all, will diving still be interesting when divers have seen all the marine creatures they want to see? On the other hand, at the rate some of these creatures are disappearing from the earth, encounters may just get rarer and rarer. It'll truly be a sad day if just a decade or two from now, the only place to see whale sharks are in aquariums like Okinawa's Churaumi, Osaka's Kaiyukan and Atlanta's Georgia aquarium. These mighty creatures belong in the open ocean, not in a glass tank - though it's a very big glass tank, that's nothing compared to the thousands of miles of open ocean water these creatures journey through each year on their migration routes. It will be a long public holiday weekend in Malaysia and Singapore this weekend as Muslims here and the world over celebrate the end of Ramadan, a whole month of fasting. We would like to take this opportunity to wish all our Muslim friends, readers and visitors Selamat Hari Raya Aidil Fitri. Stay safe on the roads. DPReview.com's Waterproof camera	group test (Q2 2009) which reviewed standalone underwater cameras (3-10 metres depth) including the Canon D10, Fuji Z33WP, Olympus Stylus Tough S6000 and S8000, Pentax Optio	W60 and W80 and Lumix DMC-TS1. TrustedReview.com's Underwater Cameras - Group Test Review which reviewed 4 standalone underwater cameras from Canon, Olympus, Fuji and Panasonic. With prices of underwater cameras below S$600 - the Canon D10 was the most expensive in the underwater camera group and currently priced at S$599 in Singapore - you can now bring your camera everywhere with you in Redang, in and out of the water. It appears that the resort at Pasir Panjang previously known as Desagreen now has a new name and website and has been rebranded as Sari Pacifica Redang resort. The Sari Pacifica group is managed by the family of ex-Malaysian tourism minister (1999-2004), Tan Sri Abdul Kadir. So it looks like they have decided not to sell the resort but to run it themselves. According to their website, they have 'full-spa facilities, including in-room service' and complimentary wifi service. It looks like the resort will be opening soon. For enquiries or bookings, call them at +603 8942 8888 or email to '[email protected]'. Apparently, they have a similarly named 47-room resort at Lang Tengah island too. Jules, Khairil, Tango and me at the Raffles Marina. At the end of June, our Forum moderators Tango, Jules and me called on Khairil, who had stopped by in Singapore at the Raffles Marina. It was good to catch up with Khairil whom I last met a few years ago at Redang when he was still a dive instructor at Wisana. Since then, he had moved to Perhentian, left the island and is now a certified commercial diver. I had not met commercial divers before so it was interesting to learn about the kinds of things (and risks) commercial divers go through. Not for me though, I'd rather stick to leisure diving to photograph fishes and other marine life than the hulls of ships or industrial underwater structures! This website has been completely updated to a wide format. It's taken me some time to redesign the pages and make the switch but I think it's well worth the effort. Looking at my site's visitor analytics, this is probably a good time to make the switch as over 90% of visitors are using screen resolutions of at least 1024x768 pixels. Not many are accessing this site from mobile internet devices like phones and PDAs but even screen resolutions on those devices are increasing all the time. The wider format allows me to use a slightly larger font for better readability (I'm getting 'old eyes' now, so it's more comfortable for me too) and also bigger images. I figured that with many users these days having broadband access, page loading times are now acceptable even with more graphics and images. While I've always avoided having ads on this site for a cleaner look, I've decided I should at least give Google Ads a try to see if the pennies add up to at least cover my hosting plan for this site at Dreamhost - if it does, it'll be a bonus! Also new are Google maps like those found on the Transport and Resort pages. I've edited my own public maps of KT and Redang island, putting in information relevant to this site. I have also posted my 2 trip reports to Lembeh and Anilao this year. Both were good dive trips with both sides offering similar kinds of critters such as mimic octopus, wonderpus, pygmy seahorses, many varieties of frogfish, scorpionfish and other strange and wonderful marine inhabitants. Anilao can certainly give Lembeh a run for its money and has the bonus of beautiful, pristine coral reefs as well. 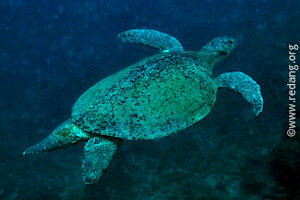 You can compare both sides in my Lembeh photo gallery and Anilao photo gallery. Back in mid July, Firefly started flights between Singapore and KT and with their attractive fares (about S$75 one way), they should give the coach companies a run for their money, especially since its a 80 minute flight time versus 9 hours on the coach. If all goes well, I will be trying out Firefly when I make another trip to Redang in October. The March Redang trip diary is now available. I've been busy since returning from that trip, but it's no excuse seeing that Tango has already posted his diary and photos in the Forum. Anyway, better late than never. I'll also be leaving for Manado in a few hours time, so I thought it best to post the diary before leaving, else I'll have another diary to write up when I return after a week's diving in Lembeh. This time, I'll be there with Seng Hock, my cousin Chee Faun and other	buddies from Layang Layang, including Pam and Low whom I met in Redang at end of March. There are not many Redang updates since the last post except that it looks like the airstrip in Redang is now back to normal operations, though it doesn't appear that the bigger ATR-72 aircraft is being used by Berjaya Air to fly to Redang yet. Also,	there was news in Singapore recently about many budget airlines given the green light to fly from Singapore to a number of Malaysian destinations, including Kuala Terengganu. That can only be good news for those who hate long coach rides. I for one, will look forward to such flights. Hopefully, the competition from budget airlines will make coach companies sit up and improve their service while lowering ticket costs to compete with the airlines on the Singapore to KT route. Pasir Panjang in March 2009, ever so gorgeous and inviting! Redang.org forum moderators Tango and Jules with Shurain, Laguna's dive instructor, and me. It's been a week since Tango, Jules and I returned from Redang from our first ever Redang Forum Moderators dive trip together and we're still suffering withdrawal symptoms. It's hard to get back to work when we're dreaming of her blue skies, white sand, azure and turquoise coloured seas! It's been 18 months since my last trip and no matter how many times I've been here, seeing Pasir Panjang on a bright sunny day still takes my breath away! This was my first visit in March and we had good weather in the day with some showers in the late evening and night. Mike, another Forum member, flew in from HK to join us for the 4D/3N dive package. We had a pleasant stay at Laguna, a great time with the dive crew and thoroughly enjoyed the delicious buffet meals which	we all felt had improved since our last visits (we had all stayed at Laguna before	at various times). We also enjoyed the Filipino house band playing at the Tupai beach bar (perhaps they were playing songs of our generation) which gave entertaining performances each night. It was also good to meet a few other forum members in the flesh (we had only known each other by our forum nicknames). This time round, we stayed at a garden view unit at the northern end of the resort, near Redang Beach, facing the hill where we sometimes found ourselves in the company of macaque monkeys from the forest. It was surprising to see Laguna and Pelangi almost fully occupied so early in the season. We had 6 good dives and I saw my first kingfish at The Wreck, a fish as large as a adult blacktip shark and which some say if seen in numbers may mean a whaleshark nearby. Visibility was average at most sites but it appears that coral cover at some sites were not as good as I remembered, possibly due to the battering during the last monsoon. I heard that some of the Reefballs planted as artificial reefs were almost fully covered by sand, while at the Wreck site, one of the boats seemed to have disappeared, probably swept away by strong currents. Earth Hour on Redang was a success. Most resorts participated by switching off non-essential lights at the beachfront, plunging Pasir Panjang beach into darkness. Some folks released glowing red lanterns high up into the night sky while many sat around hoping to catch a starry sky. Thick clouds obscured what would have been a perfect evening for stargazing and soon after Earth Hour began, a thunderstorm rolled in and vivid flashes of lighting lit up the darkened beach as if Earth was angrily protesting the abuse and treatment by her human occupants. Healthy coral growing on the wreck. 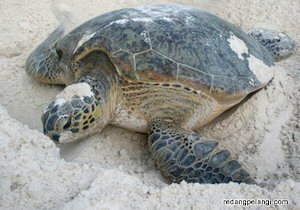 Green turtle nesting in front of Redang Bay in early March. Photo ©Eric Tan, Redang Pelangi Resort. The biggest changes at Redang had been happening behind the scenes. I was encouraged to hear about the state government's efforts in working with resort operators to protect the marine environment in Redang. A road was being constructed behind the resorts at Pasir Panjang to link to a proposed government jetty to be built at Teluk Bakau. The idea was to move tractors and other vehicles off the beach so supplies need not be transported up the beach as is currently being done. This will help reduce the number of boats currently parked off the beach which in turn would reduce pollution, make it safer for guests and snorkellers and also improve the beachfront scenery. Piped water from the mainland will supply freshwater to all the resorts while plans were underway to construct a common sewage treatment plant behind the resorts, which would hopefully be more environmental-friendly than current 2-stage septic tanks used by many smaller resorts. The resort operators themselves are also taking active ownership of reef protection and conservation. They started a community volunteer group called the Redang Reef Rangers comprising about 150 resort and dive operator staff which will help to monitor environmental problems and marine park violations such as illegal spearfishing and report such incidents to the Marine Park Authorities for follow-up action. The Reef Rangers do not have the authority to act upon offenders but function as the eyes and ears for the Marine Park Department, looking out for actions that could threaten the reef environment. The Trevicosta (Terengganu Riverine and Coastal Authority) which oversees the activities of the Reef Rangers had also been busy with the Reefscape project at Redang, a beehive-shaped artificial concrete reef similar to the Reefball. Started in August last year, 2000 reef units, each weighing about 60kg will be deployed in various sites near existing damaged	reefs to encourage the seeding and growth of coral. I'm not sure how effective these methods are, but the wooden wreck we dived showed encouraging signs with healthy coral growth on many structures, though it was only about 2 years old. Perhaps a wooden structure, held down and reinforced with concrete may help spur faster coral seeding and growth while making it harder for strong currents and waves to break up and sweep away. In another encouraging sign, we were told that a green turtle came ashore near Redang Bay in early March to lay its eggs. [Updated: Eric Tan of Redang Pelangi wrote to say he was there to witness this beautiful turtle and writes about it in his blog. Check it out to see more photos that he captured of this turtle. The eggs were kept safely and handed over to Marine Park personnel to incubate. Thanks Eric for sharing.] In the last couple of years, most turtles I had seen at Redang were Hawksbills but I was pleasantly surprised to encounter a large green turtle and a large humphead wrasse at Terumbu Kili. Many years	ago, I used to be able to see humphead wrasses while snorkelling and skin diving, even off the housereef at Tanjung Mak Cantik near Redang Reef but have seldom encountered them in recent years, even on dives. Redang is also one of three islands together with Pulau Tioman and Pulau Sibu-Tinggi under a 5-year marine conservation project (called Conserving Marine Biodiversity Through Enhanced Marine Park Management and Inclusive Sustainable Island Development) that was started in 2007 and managed by the United Nations Development Program (UNDP) and funded by the Malaysian government and GEF (Global Environment Facility). Under this program, the Marine Parks Department will improve marine resource conservation and sustainable development. While these efforts to protect the marine environment in Redang are certainly welcome, I've always felt that the fundamental problem which no one seems to be addressing is the sheer volume of visitors and the fact that many of these visitors, despite reminders and educational briefings, still behave irresponsibly. Just last week, we observed some snorkellers at Shark Bay standing and trampling on corals in their bare feet. The fact that fins are no longer rented out to snorkellers didn't seem to deter these people. To be fair, there are also many who act responsibly but with as many as a thousand people in the water everyday during peak season, just 1-in-10 irresponsible snorkellers means a hundred pairs of feet trampling corals every day! I'm not sure whether resorts, Reef Ranger or otherwise, will have the stomach to act on, and risk offending, irresponsible guests. I know from personal experience that many professional dive resorts on other islands will not hesitate to tick off or ban divers for the next couple of dives if they violated certain rules. Perhaps its about time that resorts do the same with their guests, banning them from snorkelling trips if they were caught trampling on corals, littering or harming marine life. 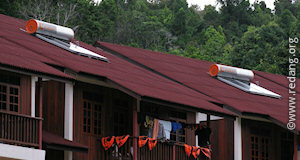 Rooftop solar heaters at Redang Holiday. Laguna's ferries are currently using Shahbandar jetty at KT until further notice while the Merang river mouth is being dredged to make it deeper. Smaller speedboats from other resorts like Pelangi are still using Merang jetty. The journey between Shahbandar and Redang takes about 1h 40min, so make sure you factor this into your travel plans. We had to catch Laguna's 7am boat out of Redang to make it back in time to catch our 5-Stars coach at 11am. Not much has changed among the resorts at Kalong and Pasir Panjang since my last visit. Desagreen Resort between Holiday and Coral is no longer up for sale. Apparently the owners have decided to continue the project and while no firm opening	date has been given, some folks think it may open around the second half of this year. Redang Bay appears to have	some new semi-detached chalets replacing its older ones while its business as usual at Ayu Mayang (though I've been unable to locate its website). Redang Holiday has installed environmentally-friendly solar water heaters on the roof of its garden view accommodation blocks. Over at Kalong beach, a white concrete stairs and walkway now links the two southernmost beaches where Mutiara and Wisana resorts are located, so that guests at both resorts have access to a common jetty. Another walkway is being planned to connect the middle beach (where Wisana is located) to the northernmost beach (where Redang Kalong and Mozana are located). Once completed, it will be possible to walk all the way from Berjaya at Teluk Dalam to the southernmost beach at Teluk Kalong via the forest path and Pasir Panjang. Berjaya resort after renovations: breathtaking seaview from premium seaview suites, beachfront, and Beach restaurant by the poolside. Berjaya beach with hillview suites in the background and Palm's restaurant. Berjaya Spa resort remains closed until further notice and the airport nearby is still undergoing runway extension and facilities upgrading works. The biggest change was at Berjaya resort over at Teluk Dalam Kecil. Their renovations almost fully completed, the resort was nothing like I remembered. 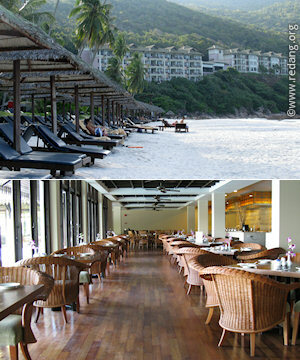 This 4-star resort had completely gone upscale, distancing itself from the rest of the resorts at Redang. We were shown many of their newly renovated rooms, from the Garden suite to the premier	seaview suites on the hilltop. The decor and quality of furnishings felt more like a luxury hotel while the view from the hilltop suites were one of the most breathtaking sea views I had seen - to me, certainly the best seaview in Redang. The premium suites offered jacuzzis that overlooked the bay, as did the well-equipped gym located in one of the hillview blocks - here, you don't need a treadmill to take your breath away, just the panorama outside the full-length glass windows. The landscaping and dining facilities were also top of the class, as was the spa. Wi-fi internet access was available in all rooms. Electric buggies were available to transport guests up and down the hillview rooms, or guests could choose to use the stairs. For those with deeper pockets, Berjaya now offers an unsurpassed level of luxury accommodation in Redang with 220 rooms on a quiet, secluded and exclusive beachfront. Singapore to KT by air? Firefly's ATR 72-500 aircraft. Berjaya Air also operates this aircraft. News has it that Firefly, a wholly-owned subsidiary of Malaysia Airlines, has been granted approval to fly between Singapore and Kuala Terengganu using its ATR 72 twin turboprop aircraft, the same aircraft that Berjaya Air will	eventually use to fly to Redang. It's not clear when this service will start but it will be a welcome alternative to the long coach journey. Firefly already flies from KL's Subang Airport to KT. For one hour, you can be part of the world's first global election between Earth and global warming. 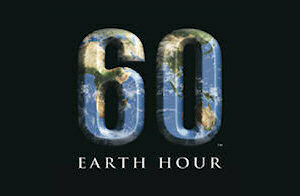 To vote planet Earth, just switch off your lights for one hour from 8:30pm to 9:30pm on 28 March 2009. The target is to have 1 billion votes worldwide to present to world governments meeting at the Global Climate Change Conference in Copenhagen 2009 to show that people of planet Earth are concerned about global warming and the planet's future, our childrens' future. VOTE EARTH is a call to action to every individual, business and community. This is a call to the entire community at Redang - the resorts on the island, the resort offices and travel agents on the mainland, island residents and individual visitors - to show your support. The entire planet, including the beautiful coral reefs and marine environment in Redang and elsewhere in the world, is under threat from global warming. This is our opportunity to show that we care and that we are concerned. Even KLCC with its beautiful Petronas twin towers has signed up for this (check out Malaysian business and companies that have pledged their support at Earth Hour Malaysia). With 2009 visiting season underway, for me, if all goes as planned, I'll be in Redang together with Tango and Jules, this website's forum moderators on a 4D/3N diving trip from 28-31 March. It'll be the first time we're travelling together to Redang. As usual, we'll be collecting news and updates and posting them here, so be sure to check this site after we return. If you happen to be in Redang at that time and want to say hello, we'll be over at Laguna. If we're not in, just leave a message for us at the reception. The river mouth at Merang is apparently silted up again, preventing the larger resort boats from using the jetty there. So for now, many resorts like Laguna are using Shahbandar jetty at KT instead of Merang jetty. It's not clear when Merang jetty will resume normal operations, so if you are making a trip up to Redang, make sure you double-check with your resort or travel agent which jetty you will need to be at to catch your boat out to Redang. The air strip at Redang, currently closed for expansion and renovation works, is targeted to reopen on 16 April after which it will be able to take bigger aircraft like the French-built ATR 72-500 72-seater aircraft that Berjaya Air will be using to replace its 48-seater Dash 7 aircraft that it currently uses to fly into Redang. Not sure if it's due to the current monsoon season, but there's been some really strong winds buffeting my 19th floor apartment in Singapore the last few weeks. Sounds like a pack of coyotes howling at my windows though there are no coyotes in Singapore. It's so strong that even closing or opening the sliding windows requires	more effort than usual. Makes me wonder whether Redang is taking a heavier-than-usual beating this monsoon and whether all this funny weather lately is due to the changing global climate conditions. 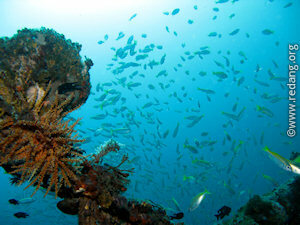 If all goes well, I hope to be in Redang end March for a dive trip after more than a year's absence. It'll be the first trip together with Tango and Jules, our Forum moderators. Resorts are still closed now and not all have updated their websites with 2009 rates, but I've updated the Resorts page with whatever 2009 rates that have been published and also updated the Visiting pages with the 2009 holiday calendar. Rates have gone up slightly compared to 2 years ago but that's to be expected as even a cup of coffee at my neighbourhood kopitiam seems to have increased by 15-20% over the last year. With prices going north and global economic conditions heading south, it's going to be a tough year for a lot of folks. Redang resorts might actually benefit as folks cut back on overseas holiday spending and go on budget holidays locally instead. News has it that 60% of Redang visitors are foreigners, mainly from Singapore, while only 40% are local Malaysians, so we might actually see an increase in number of visitors from Singapore. With the current favourable exchange rate, Redang ranks high as a value-for-money holiday destination for those working in Singapore. So plan your trips well ahead of time just to be sure there are rooms available. The Redang airstrip is currently undergoing a runway expansion to cater for increasing tourist arrivals and to make it safer to handle emergencies. All Berjaya Air flights operating into and out of Redang have been suspended until further notice. The Kuala Terengganu airport has also been upgraded to handle international flights, sporting a new terminal and an extended runway which can now accommodate Boeing 747s. While all these developments are good for state tourism, I can't see how it can be good for marine conservation and protection in Redang. Increasing visitor arrivals have always been detrimental to the health of any marine ecosystem anywhere. Adding all the resort rooms on Redang together, we currently have at least a 1000+ rooms. These are minimally twin sharing with some taking up to 6 people. Assuming 100% occupancy at peak season with an average of 3 to a room, there's going to be 3000 people on Redang at any one time. If we assume that one-third to half of these go diving or snorkelling, that's at least a thousand people in the water. No wonder we hear reports that the only sea visible at the Marine Park Center	(which most resorts visit at least once a day) on some days is a sea of arms and legs! Some places	limit the number of resorts/rooms or visitors but charge a higher visitor fee, striking a balance between controlling the number of visitors and revenue generation. It's tough but it may be the only way to protect the marine ecosystem. I hope the relevant authorities also seriously think about how best to protect the island instead of just focusing on revenue generation. Make sure you check out the resort's own website for more offers and promotions. To all our Chinese readers, may I take this opportunity to wish you a blessed and meaningful Chinese New Year this 26 & 27 January. Though the red packets (ang pows) may be less this year, for those receiving, be thankful for the hands that give it and for the heart's wishes that go with it. For those giving, be a cheerful giver!